The Internet seems to be filled with fake geek boys who watch Game Of Thrones for Daenerys Targaryen’s slinky outfits but who can’t describe the geological specificities of Westeros. Thankfully the site Generation Anthropocene is demonstrating its true nerd cred with a highly detailed map that breaks down the fictional Game Of Thrones world into its geologic components. 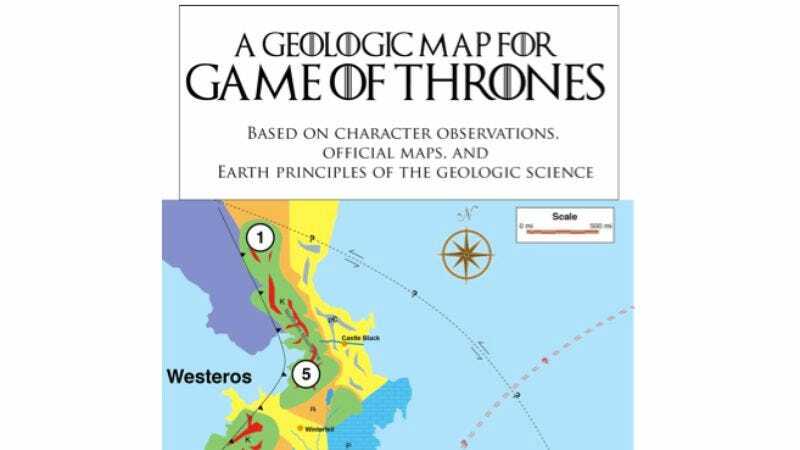 Based on “character observations, official maps, and Earth principles of geologic science,” the expansive project not only explains the rock types of “present day” Westeros, it extrapolates 500 million years of planetary evolution as well. The site lists nine major geologic events that occurred on Westeroes, including the rise of the Black Mountains, a large-scale Ice Age, the boiling of the Dorne sea (potentially by dragons), and the split of Essos and Westeros 25 million years ago.